Each contact can be assigned attributes, called contact fields, that hold values such as their names, phone numbers, and any other individual information you want to include. Contact fields are divided into two types, default fields and custom fields, and they can hold three types of values: text, numeric, or date & time. When a contact field is created, the default value is null unless the field is imported from a spreadsheet with a pre-existing value or updated when a contact reaches an Update the Contact action in a workflow. Contact fields can be added within the contacts tab using the method described below, or by interacting with a flow using the Update the contact action. 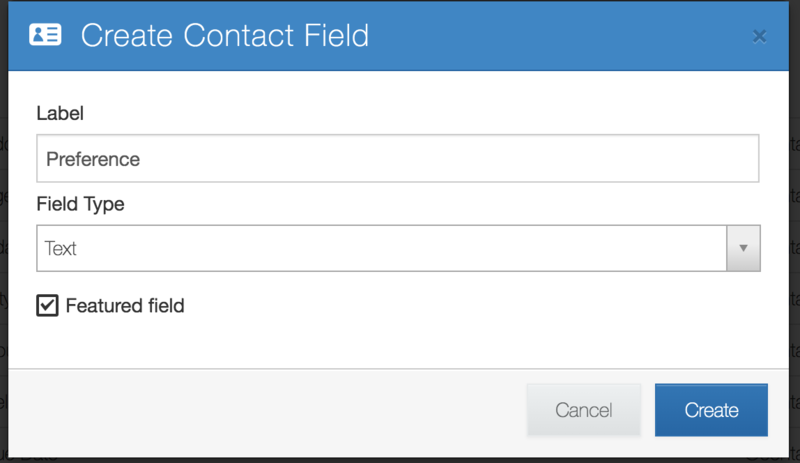 Once you've added a contact field, you can refer to its value using the variable @contact.[field_name]. For example, the above contact field 'Preference' will be referenced by the variable @contact.preference. Click here to learn more about using variables. To change the value of a recently-created contact field, you can update it using the Update the contact action or by editing a contact field value via the contacts tab. For example, when a new phone number sends a message to a channel connected to your account, a new contact will be created with a null Name value and null values for each contact field you've added. The new contact will only be identifiable by their phone number until their other field values are updated.